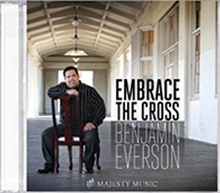 Majesty Music is pleased to present the latest album by Benjamin Everson. Known for his clear, smooth solo voice and his rich, harmonic a cappella "vocal orchestrations," Ben is a talented songwriter, penning songs in a peaceful style. His purpose is to provide Christians with fresh, beautiful music that calms the heart and rejoices the soul. Embrace the Cross features fresh arrangements of classic hymns, original songs by Ben, and several Majesty Music favorites that promise to uplift your spirit and tune your heart to praise the Lord.